Asked by Italy's most-prominent daily earlier this month for an assessment of his first year as Pope, Francis demurred, saying "I only do that every fifteen days, with my confessor." 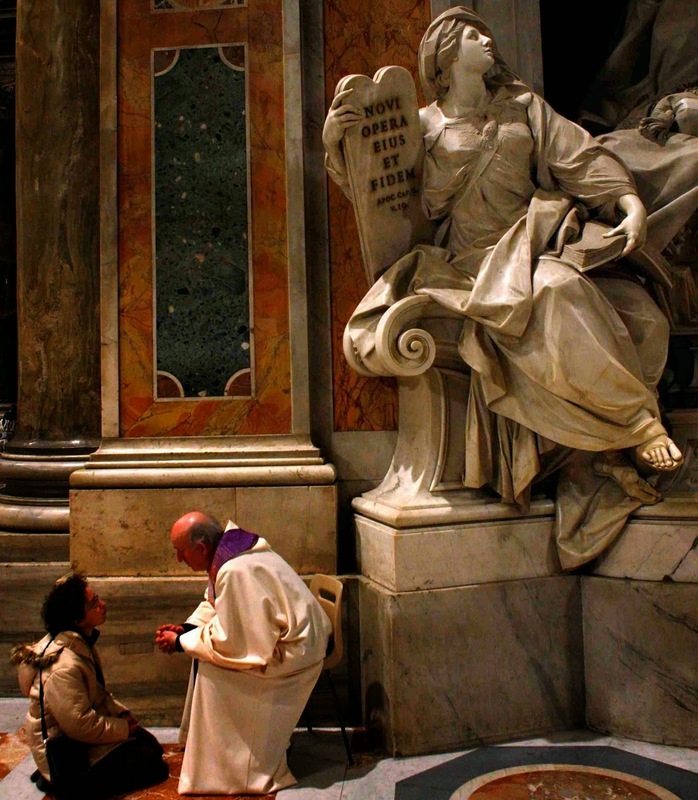 Even if he's taken all the sacraments for his latest general audience series, over the last 54 weeks, Papa Bergoglio's spoken of none more frequently or urgently than Confession, Penance, Reconciliation – whatever you call it. And for a Pope who continues to be both championed and castigated as some sort of raving iconoclast, the ecclesial Left's post-Conciliar ambivalence at best toward "the box" should serve as a reminder that the reality of things is rather more complex than the chattering-class polarities of these days tend to admit. Indeed, were the buzz to hold water, a truly "progressive" Pope would've already wound back his predecessors' crackdown on the "third rite" of the sacrament – the liturgical name for general absolution without individual confession, which had become prevalent in some quarters over recent decades until Rome took to enforcing the condition that the practice was intended only for situations where massive numbers of penitents were in imminent danger of death or another insurmountable reason. 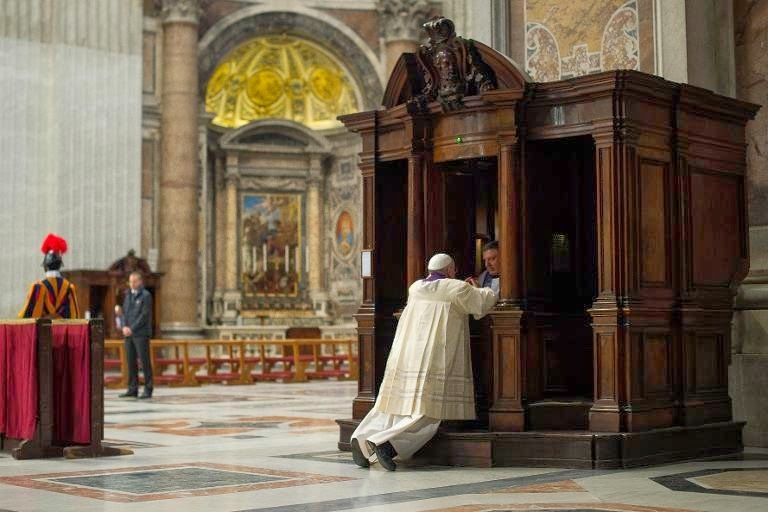 With Francis – who has attributed his own conversion to an experience in the Confessional – any return to "box"-free absolution is about as likely as the restoration of the tiara. Even that, however, was merely a prelude for what happened in the Basilica tonight. At a Lenten service with the second rite of penance – the communal examination of conscience with individual confessions – Francis took it on himself to back up his words with example. The footage is indeed unprecedented – while John Paul II routinely heard the confessions of 12 laymen every Good Friday in St Peter's and B16 spent some time administering the sacrament in a Madrid park at World Youth Day 2011, no Pope has ever been seen as a penitent. After his turn on the other side of the sacrament, Francis spent another 40 minutes hearing confessions. While Francis plugged the event as "a feast of forgiveness" at his Sunday Angelus – and the dioceses were reportedly alerted in February – as of press time, only two US churches are known to have joined the effort: San Antonio and Juneau. The PCPNE has expressed the intent that the "24 hours" will become an annual opportunity over the days around Laetare Sunday. In general, meanwhile, beyond starting this Friday off with another Domus Mass homily on Confession, by midmorning the Pope did it yet again, telling a conference arranged by the Apostolic Penitentiary that the Confessional "is not a court of condemnation, but the experience of forgiveness and mercy!" "In all the dioceses and in the parish communities," Francis urged it as "very important" that "the celebration of this Sacrament of forgiveness and salvation is particularly taken care of." According to CARA figures, just 14 percent of US Catholics partake of the sacrament more than once a year. While many local churches have aimed to turn the tide – most prominently by adopting "The Light Is On For You," which sees every parish in a diocese open for confessions on each Wednesday evening of Lent – experience shows two things: first, the awareness and effectiveness of "Light"-style initiatives tends to be blunted unless all the dioceses in a given media market take it up together, and contrary to what many might think, confessions actually increase to the degree that a parish expands opportunities for them beyond the usual hour or less on Saturday afternoons. In any event, it's worthwhile to recall that all of 17 months ago at the 2012 Synod, several prelates highlighted Penance as "the sacrament of the New Evangelization," while others urged that the church's effectiveness in re-sparking the faith required "a new humility." Sure, those assessments have come to life in a powerful way over the last year... but perhaps today saw them resonate even more than before.